Striking a pose on the Badwater Basin salt pan, the lowest place in North America. Death Valley is a land of contrasts, and it is probably one of the most unique national parks that we have visited. It holds the honor of being the hottest place on Earth. 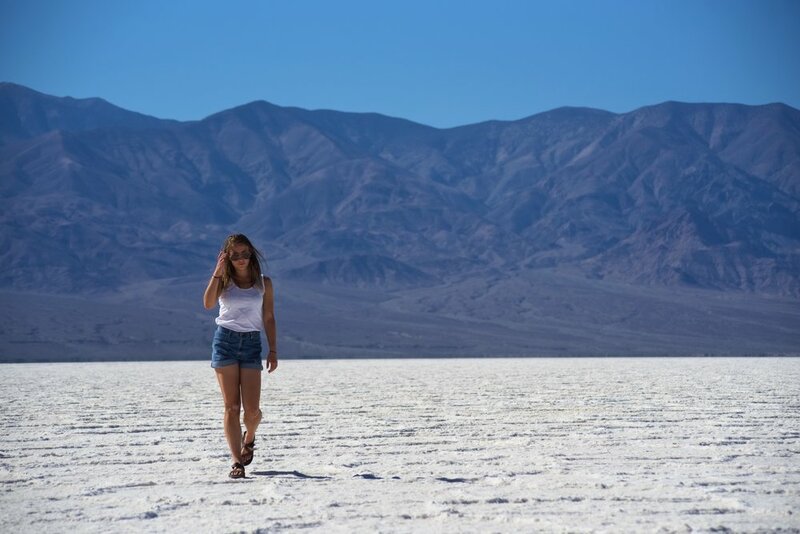 The lowest place in North America, Badwater Basin, is found in the park at 282 below sea level, but the mountains in the park rise to over 11,000 feet in elevation. There are white salt flats, gargoyle-esque formations of salt crystals, massive sand dunes, eroded badlands, and colorful mountains. Death Valley is also massive. It’s the largest national park in the contiguous US! A great deal of the park is only accessible with a high-clearance 4x4 vehicle. For example, the famous Racetrack Playa where “sailing stones” mysteriously move across salt flats, is a 27 miles down a rough 4x4 road. Because it is so hot most of the year, there are also relatively few developed hiking trails. 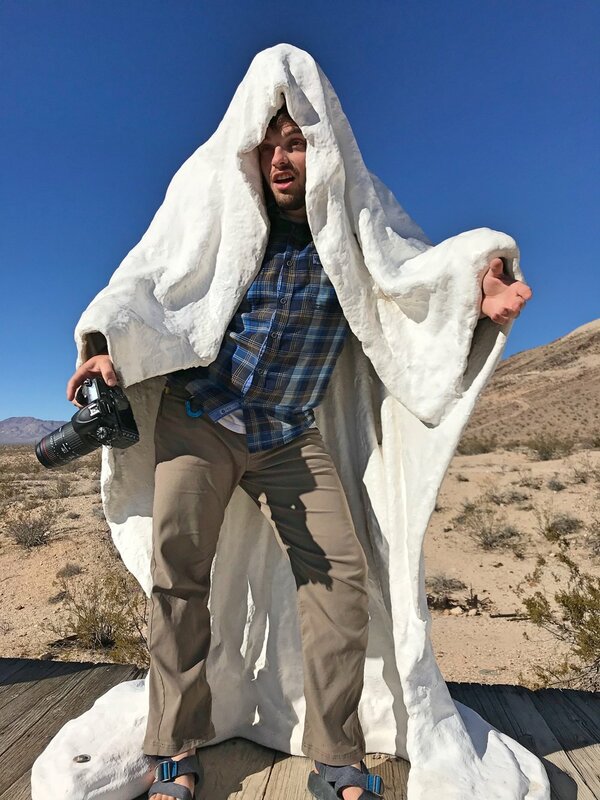 We spent three days visiting Death Valley in October. October is a great time to visit Death Valley. It’s considered the shoulder season. It’s much cooler than the summer temperatures, so hiking on most days is still an option, but the full winter tourist season hasn’t begun yet. We entered Death Valley from the east, starting in Beatty, Nevada. Beatty is a cute little town, and there are tons of wild burros that hang out around the town. The town also has a weirdly nice gas station called Eddie World. They have basically every snack, candy, dried fruit, nut mix, and exotic jerky imaginable imaginable. The road we took leading to Death Valley. Nevada has many lonely roads like this. Wild burros outside Beatty, Nevada. 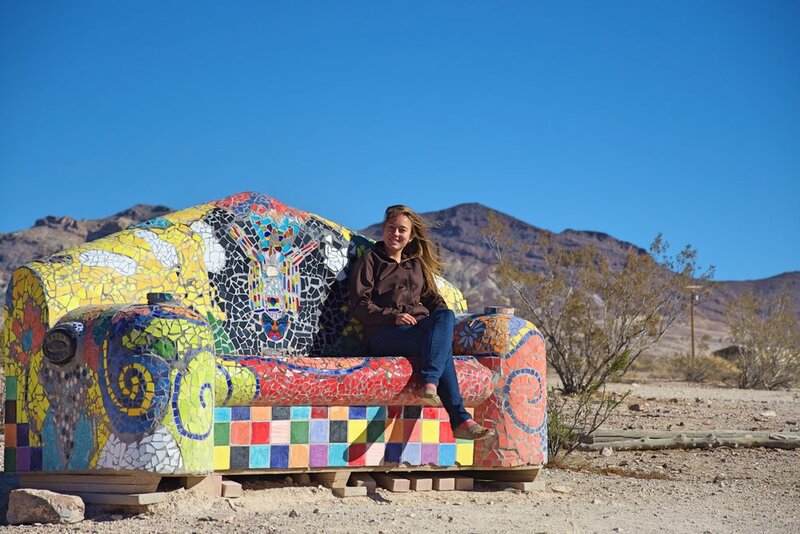 Near the ghost town of Rhyolite, there is a really quirky outdoor sculpture garden. We weren’t aware of the Goldwell Open Air Museum until we saw some of the larger sculptures as we approached Rhyolite. Some of the most interesting sculptures in the park are shrouded, but empty figures cloaked in white. One called “Ghost Rider” is an empty cloak about to mount a bike, while another features an artist holding a palate. The most famous though is the eerie interpretation of Christ and his disciples at the Last Supper. To make these figures, the artist, Albert Szukalski wrapped live models in plaster and fabric, slipping them out before plaster had set! In addition to the shrouds, we loved the steel origami crane and the mosaicked couch, among other sculptures in the museum. Kaylee’s Big (not so) Comfy Couch. One of the sculptures in the museum. The Goldwell Open Air Museum is worth the stop! 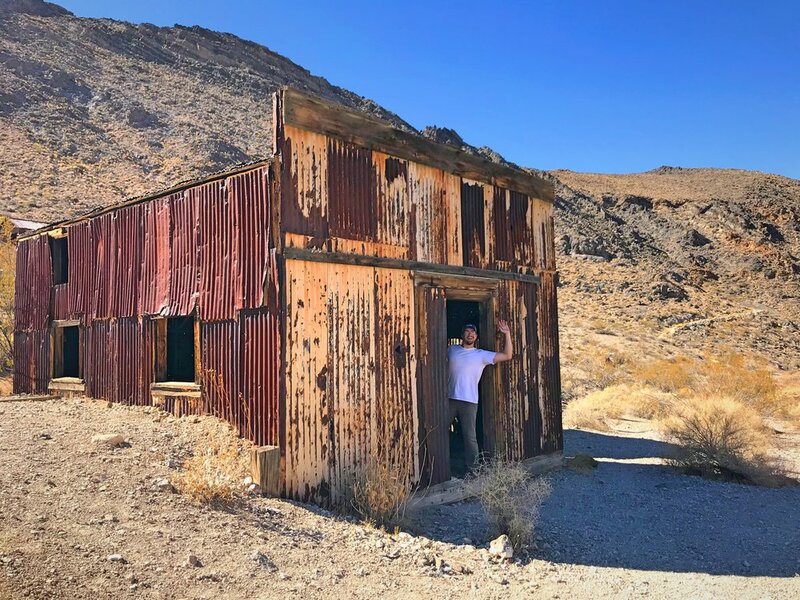 The ghost town of Rhyolite and the Goldwell Museum are not technically in Death Valley, but its proximity to the park boundary makes it worth mentioning. 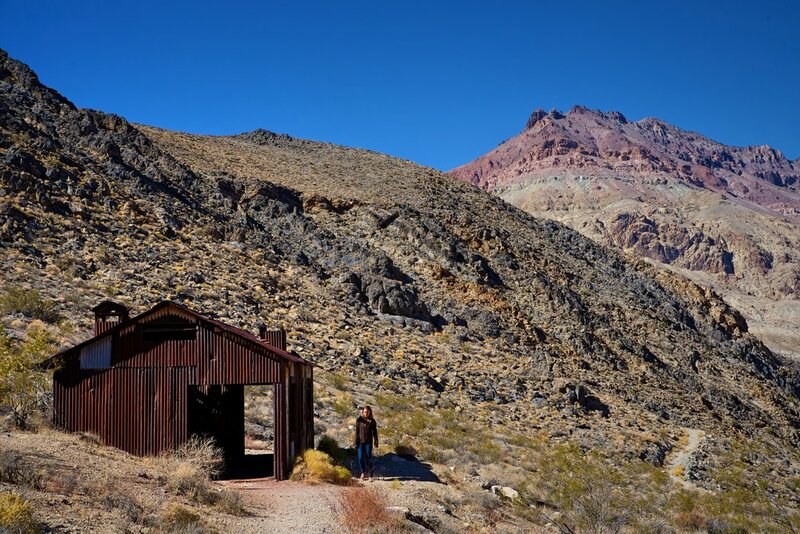 Rhyolite was developed on gold mining speculation beginning in 1904. At its peak, Rhyolite’s population was 5,000 to 8,000 people. During its heyday, there were foundries, machine shops, a school, hotels, churches, banks, stores, a hospital, an opera house, bars, and a red light district. The town even had electricity. By 1910 most of the residents had left, and by 1916 the light and power in the town were turned off. 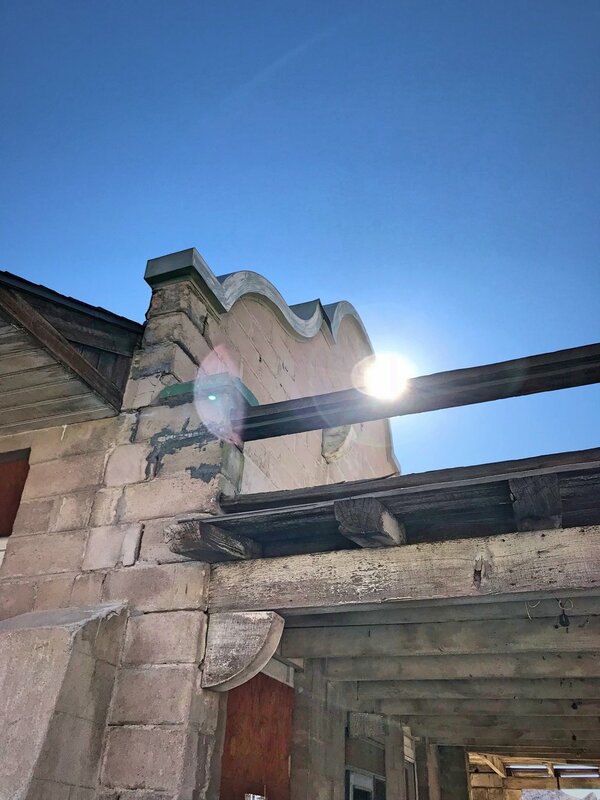 Rhyolite’s train depot is still in great shape. A boxcar has been left near the train depot. It’s incredible that some of the wooden buildings have held up so well. Ian waiting for a ghost train to arrive. These quirky trees are Joshua Trees and they are all over this part of Nevada. Today all that’s left of the town are ruins, some of which are fairly well preserved. The walls of the three story bank are still standing, along a few other buildings on the former main street. The beautiful train depot is incredibly intact. There is an old box car with peeling paint that is in good shape as well. Ian on the porch of the Rhyolite train depot. A quick kiss before Ian had to board his ghost train. The most incredible part of Rhyolite though is the bottle house. 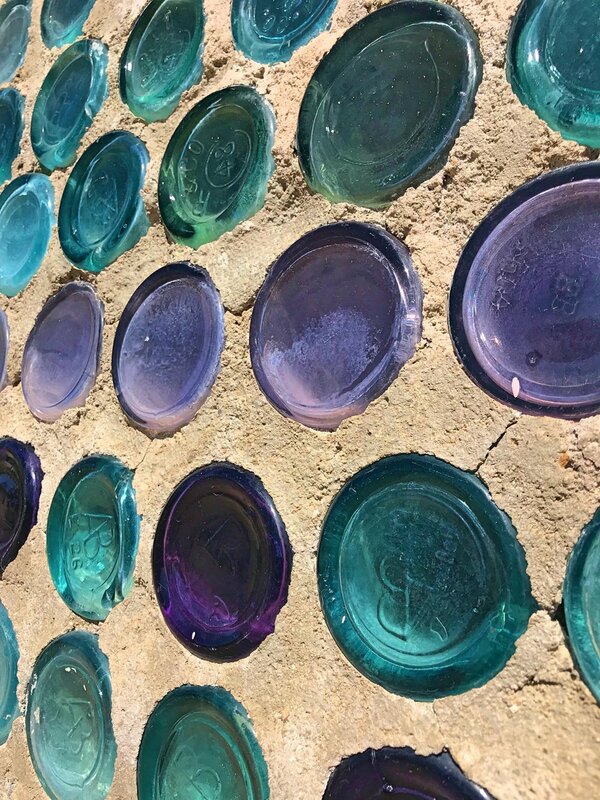 The house was built out of around 50,000 bottles by Tom Kelly in 1905 during the town’s mining boom, when there were many bars, and thus many bottles. The house takes on a bluish hue from the glass of the bottles and has three rooms and a quaint orange and pink trimmed porch. Paramount Pictures replaced the house’s roof in 1925 when they used it for a movie set. The house was actually inhabited by Tommy Thompson and his eight children until 1969! The colors of the bottles give the house a really beautiful color. After Rhyolite, we headed into the park on Titus Canyon Drive. The drive is one of the most popular backcountry drives in the park. We had read online that other Sprinter owners had done the one-way 27 mile drive, and the park service only says it requires “Two-wheel drive, high clearance vehicles.” Indeed, we made it in our two-wheel drive high clearance van, but let me tell you, we will never do that again! The road approaching the Grapevine Mountains begins easy and flat. As you rise toward Red Pass, the highest point in the drive, the road begins to switch back into increasingly tight turns. But since the road is one-way, it’s not like we could turn back. The Grapevine Mountains are super colorful. A few of the narrow, tight switchbacks on Titus Canyon Road. Ian climbed a ways up Thimble Peak to get this bird’s eye shot of the van on Red Pass. As you approach the summit, the road gets narrower and there are drop offs right off the edge of the road. Because of the length of our vehicle, we have a wider turning radius, so we had to get way closer to the edge than the Jeeps, which were the only other vehicles we saw on the road! Even Ian was nervous, and he has no fear! We stopped at Red Pass and took pictures of the beautiful views in both directions. It was a nice reprieve from the harrowing drive to get out and walk around a bit. Ian even climbed a little way up Thimble Peak. Then we began our descent. I’m not sure what was scarier—going up or going down! In some places we were driving over huge rocks and since the road was so steep if there was loose gravel on the rocks, the van would slip a bit. I was clinging to the handle in the door, basically in tears, fearing these were our last minutes together before sliding off the edge of a mountain in a place literally named Death Valley. Somehow, we made it to the bottom of the pass where there is another ghost town from the 1920s called Leadfield. We took a look at one of the closed off mining shafts and explored some of the old wooden buildings. We have no idea how they got all that lumber there since there are no trees around and the settlers probably only would have had Model Ts at best and burros at worst! Leadfield doesn’t have nearly as many buildings as Rhyolite. Mine shafts can be really dangerous, so we just snapped a picture of the entrance. Welcome to Leadfield, a mighty fine ghost town! Just beyond Leadfield, Titus Canyon begins. The road begins to follow a wash as limestone cliffs rise on either side of the road. As you descend the canyon begins to get narrower and narrower. Inside the canyon, we stopped at Klare Spring, which is easily spotted by the vegetation in supports. Above the spring there are ancient Native American petroglyphs etched into the rock. The ancient petroglyphs at Klare Spring. Kaylee walking by the road in Titus Canyon. The final 1.5 miles of Titus Canyon are the narrowest. The park service says that they are often the most difficult to drive, although our experience was that it was smooth sailing from Leadfield on. The canyon narrows to about 20 feet wide in some places, and the walls are an amalgam of smooth folded layers of stone. If there is no one coming up behind you, stop and take a closer look to appreciate all the different types of rock in the walls. 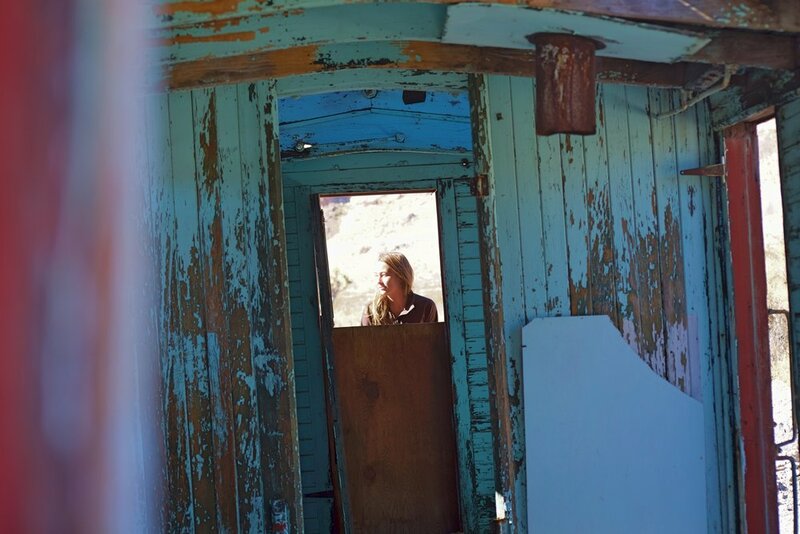 From the narrows you emerge abruptly into Death Valley. The canyon essentially just ends, and you look out over the sand dunes and salt flats of the valley floor. From there the road is two-ways and there is a parking lot at the overlook. If you want to see Titus Canyon, we’d recommend just parking here and hiking about a mile and a half into the canyon on the road. It’d sure be a lot easier than spending six hours driving at approximately a brisk walking pace. The narrows of Titus Canyon get really narrow at some points. Some conglomerate rock in the walls of Titus Canyon. If you drive Titus Canyon, make sure to get out of the car a few times. Free camping nearby: On our first night we headed out of the park back toward Beatty to a spot called “The Pond.” There is reservoir surrounded by rushes and with lots of birds that forms a little oasis in the dry environment. The spot is pretty popular, but we were able tuck our van in on the far side of the pond for a bit of privacy. There are also 4x4 roads that lead toward Beatty that we enjoyed running on. Our van parked at the Beatty Pond free campsite. The reservoir supports a lot of birds and other wildlife you wouldn’t normally see in the desert. Our first stop on our second day in the park was at the Mesquite Sand Dunes. They are sweeping but short white sand dunes that have collected over a large area. The tallest dune is only about 100 feet tall and is about a mile walk from the parking lot, though there is no designated trail. We walked a little ways out, but decided not to go all the way to the largest dune since it is incredibly hot out on the sand, and we had recently visited the much grander and cooler, coastal Oregon Dunes. The Mesquite Flat Sand Dunes in the distance. The dunes are fairly short when you get into them. After enduring the heat of the Dunes, we stopped into the general store of Stovepipe Wells to get some soft serve. There’s not really any other reason to stop there besides the ice cream. The park’s visitor center is at Furnace Creek. In July the average daytime temperature at Furnace Creek is 116 degrees! The small settlement holds the record for the hottest temperature on Earth at 134 degrees. In the summer, you can lose two gallons of water just sitting in the shade. Remarkably people actually live here. 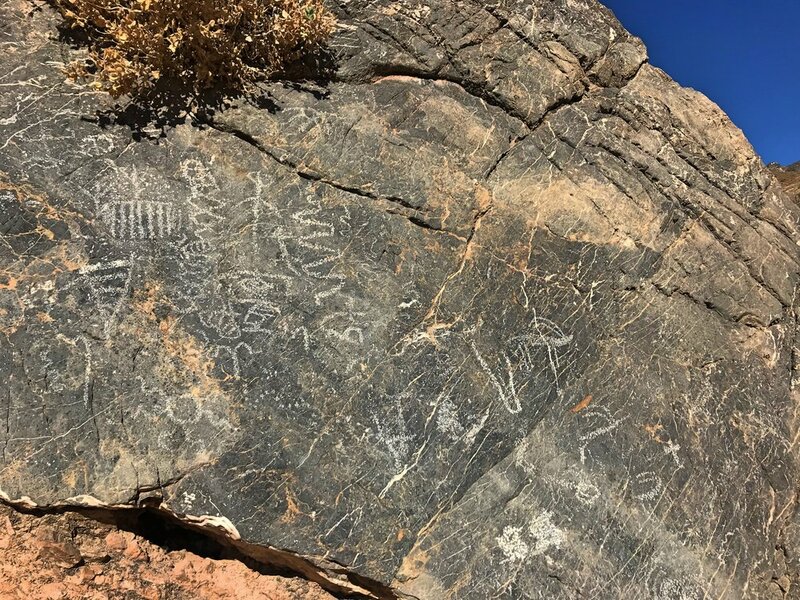 The Timbisha Shoshone have inhabited the area’s oasis for centuries, and in 2000 after lengthy legal battles, they regained 7,500 acres of the ancestral homelands that were seized when the park was established. We were fortunate that it was only 86 degrees when we were there. A two-stringed erhu left behind by one of the Chinese miners during the mining boom days of Death Valley. After checking out the exhibits in the visitor center, we headed down Badwater Road to Badwater Basin. The basin is the lowest place in North America at 282 feet below sea level. What is absolutely insane is that the highest place in the lower 48, Mt. Whitney (14,505 feet), is only 84 miles away! Badwater Basin is the location of Death Valley’s iconic white salt flats, which are covered with polygonal shapes in the salt crystals. These shapes form on the rare instances that rain floods the salt pan, leaving the crisp white polygons when the water evaporates. It only rains 1.9 inches a year in Death Valley, but it’s so hot and dry that over 12 feet of water would evaporate in a single year if the basin were filled. To reach the polygons, you have to hike out onto the flats about a half mile. It’s easy flat walking but the incredibly hot, dry climate actually made it a bit challenging for us. We drank an entire Nalgene of water while walking that single mile. Walking on the Badwater Basin salt pan is actually pretty challenging because of the extreme heat, even though it’s perfectly flat. 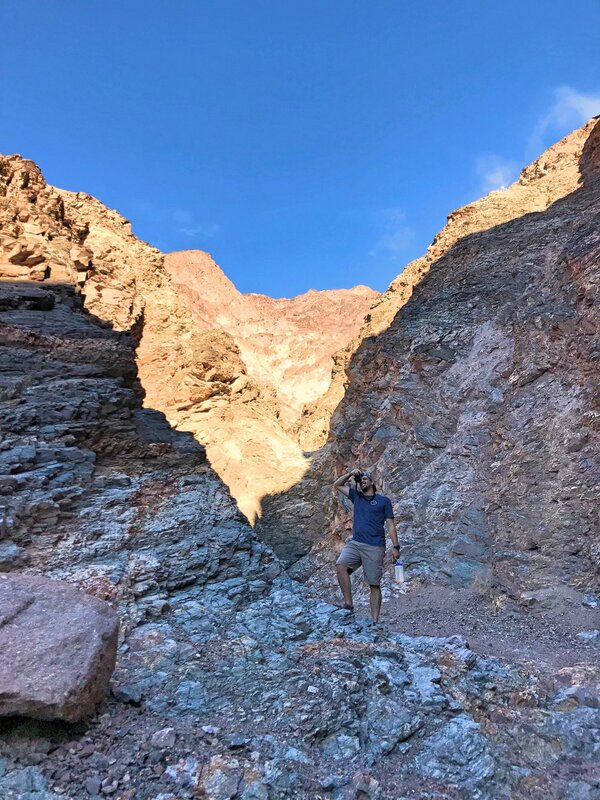 Our favorite hike in Death Valley was Natural Bridge. The bridge is only about a 10 minute walk from the parking lot along the pebble floor of a small canyon. The blocky bridge spans from one wall of the canyon to the other so it is quite different from the sandstone arches we visited in Kentucky or the graceful arches of Utah. Crossing under and beyond the arch, there is a vertical chute that was hollowed out by a now dry waterfall. Venturing on from the dry fall the hike meanders through a red rock ravine. In a few places there are smooth, marble dry waterfalls and jumbles of boulders that are pretty easily scrambled over. In one place easiest to squeeze under a large boulder caught in the canyon. The hike ends at a 20-foot wall made of darker rock. The Natural Bridge inside the canyon. Kaylee walks on the trail beyond the bridge. Ian snaps a shot near the end of the canyon. Devil’s Golf Course was Ian’s favorite spot in the park, probably because it’s just plain weird like him. There’s not really anyway to describe it. Halite salt crystals form grotesque, sharp figures that stretch far into the distance. While the Badwater Basin collects a thin layer of water when it rains, the slightly higher Devil’s Golf Course does not collect water leaving this area of the salt deposits susceptible to the weathering forces of flowing water. The weathering has sculpted the area into jagged brown and white formations about a foot or two high. 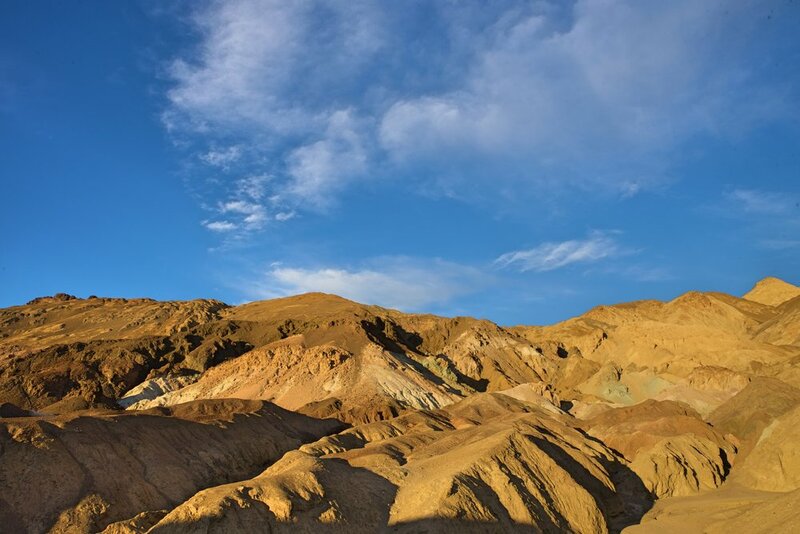 Studies have indicated that the salt and mud deposits extend to a depth of 1,000 feet below the surface and reaching a depth of 9,000 feet in one part of Death Valley! We tried to explore the area, but it was really difficult to walk into the crystals. They are really sharp! We ended up not venturing too far from the parking lot for this reason. Walking in Devil’s Golf Course is really hard because you have to step around the formations. The formations stretch on as far as you can see. In case you wanted to know…they do actually taste salty. Our final stop along Badwater Road was Artist’s Drive, a short road that passes mountains covered in colorful mineral deposits. Artist’s Palette is a great spot to photograph the pastel colors that are splashed across the mountain side. Because there is almost no vegetation in Death Valley in makes seeing the colors of the mountains easy. You can see the colors in the mountainsides because there is so little vegetation. Artist’s Palette has many colored splotches of minerals. Before we headed out of the park on our second night, we were able to just barely catch the sunset at Zabriskie Point. Below us there were beautiful light colored badlands, and above us there were rare clouds that were reflecting the last rays of sun. We literally ran to get this composition before the colors in the sky changed. It’s fairly rare to have nice clouds like this in Death Valley. Free camping nearby: On our second night we camped just outside the park boundary at a place known as “The Pads.” The spot is an abandoned RV park where there are a bunch of level cement pads to park on. It’s not all that beautiful, but it feels so much like a real campground that some foreign travelers asked us if they’d have to pay to camp there! On our third day in the park, we decided to check out the Zabriskie Point badlands via a trail run. We started our run around 8am, and the three-mile loop was about all we could handle in the heat. The trail took us over firm clay, down into the white, eroded hills and gullies of the badlands. Once at the base of the hills the trail follows a dry (obviously) wash, until emerges again at the overlook. The Badlands Trail at Zabriskie Point is great for trail running, just a bit hot! The eroded, white badlands of Zabriskie Point by day. The Golden Canyon Trail has a similar look to Zabriskie point in some places. Red Cathedral has massive curved walls that face back toward Death Valley. Our final stop in the park was at Dante’s View. Dante’s View is at the end of an 11-mile paved road, and they definitely weren’t kidding about it being steep at the end. The view is high above the valley floor, and it’s an otherworldly sight. The bright white salt flats look almost like water or snow and anywhere water had carried the salt there were serpentine white paths winding through the brown desert. Parts of the Devil’s golf course sparkle in the sun. 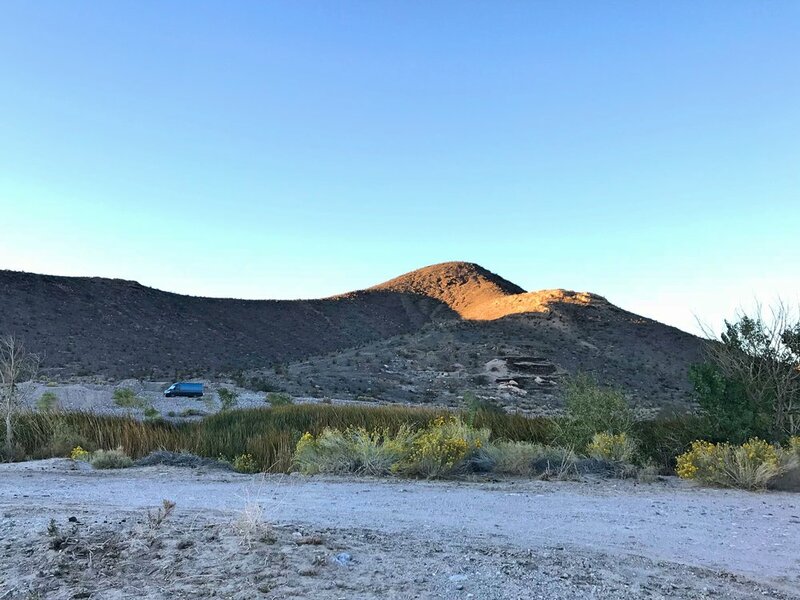 The valley floor is absolutely flat while the Panamint Mountains across the the valley rise abruptly to elevations greater than 11,000 feet. We’ve never seen anything else close to this view! What a strange place! It does really look like something out of the mind of Dante…or something out of Star Wars. In fact it was used in the original movies as the location for the Mos Eisley Cantina, a “wretched hive of scum and villainy,” on Tatooine. Dante’s View is shown at 0:53 in this movie clip.